A story with timeless, universal themes: family, coming of age (and leaving behind childish things), and the inevitable time when, past our prime, we will all face potential social obsolence. 98 min. Walt Disney Studios Distribution. Director: Lee Unkrich. Cast: Tom Hanks, Tim Allen, Joan Cusack, Ned Beatty, Don Rickles. Even though film critics will often complain of artless manipulations at the movies, my jaded lot does yearn for that rare, honest emotional experience at the movies. Pixar has often demonstrated a knack for storytelling, but it's the Toy Story movies, in particular, that have shown a capacity for playing the audience's heartstrings. In part, that's because most Americans can directly relate to having had beloved toys in our youth, toys to which we had innocent emotional attachments and about which we have fond memories of joyful play and carefree times. But there's another reason that the Toy Story movies are so compelling: from the protagonists' perspective, these are stories predicated on the need to feel useful, wanted, and loved. Perhaps the timing of Toy Story 3—coming as it does in a time of severe underemployment and economic uncertainty—has lent the film added relevance for adult audiences. But it's also a story with timeless, universal themes: family, coming of age (and leaving behind childish things), and the inevitable time when, past our prime, we will all face potential social obsolence. Yes, Toy Story 3 will speak as loudly to the AARP crowd as it does to the teens who grew up on the franchise (kids new to the story come in a distant third). The third Toy Story begins with seventeen-year-old Andy (played, as before, by John Morris) just days from moving away to college. Andy's mom (Laurie Metcalf)—worrying herself around the house to keep her sadness at bay—instructs Andy to make a decision about the contents of his toy chest: each toy must go to the attic, the trash, or Sunnyside Day Care, as a donation. A mix-up lands the toys—including cowboy Woody (Tom Hanks), spaceman Buzz Lightyear (Tim Allen), cowgirl Jessie (Joan Cusack), Mr. and Mrs. Potato Head (Don Rickles and Estelle Harris), piggy bank Hamm (John Ratzenberger), Rex the T. Rex (Wallace Shawn), Barbie (Jodi Benson) and Slinky Dog (Blake Clark)—at Sunnyside, which they hope will be a kind of "sunny" Floridian retirement community for their golden years. As they quickly discover, outwardly avuncular stuffed animal Lotso (Ned Beatty) lords cynically over the daycare toys, sowing fear like the commandant of a prison camp. 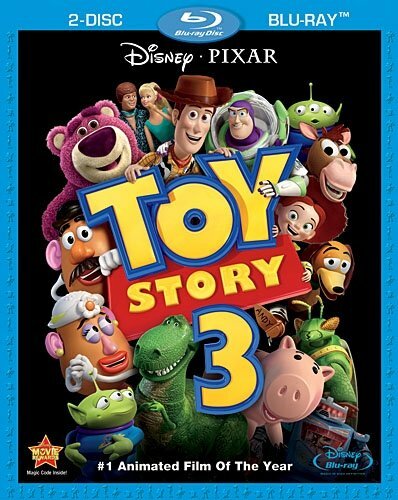 In action terms, then, Toy Story 3 largely resembles a prison-escape film, along the lines of The Great Escape (animation buffs may find their minds wandering back to the classic Simpsons episode "A Streetcar Named Marge," with its prison-like daycare). Of course, the daycare also presents a prime opportunity to introduce many new toys, including clotheshorse Ken (Michael Keaton), sticky octopus Stretch (Whoopi Goldberg), and my personal favorite: a field-tested Fisher-Price Chatter Telephone (Teddy Newton). A subplot that finds Woody briefly in the playroom of young Bonnie (Emily Hahn) brings into the story three toys experienced with play-acting: Buttercup (Jeff Garlin), Trixie (Kristen Schaal) and Mr. Pricklepants (Timothy Dalton). Fans of the series should also keep their eyes peeled for the cameo appearances by erstwhile toy-bully Sid (Erik von Detten). Under the direction of Lee Unkrich, the hallmarks of the series remain in place: crisp pacing and pretty much air-tight plotting from Pixar's creative team, a sharp script (this time, by Oscar-winning Little Miss Sunshine scribe Michael Arndt), Randy Newman's music (including new song "We Belong Together"), top-notch vocal performances, well-honed visual composition, colorful design and dazzling CGI "camera work." But what makes Toy Story 3 primally appealing is its emotional intelligence. The palpable terror of being forgotten, discarded trash culminates in a junkyard sequence that unmistakeably evokes Schindler's List (a furnace screams "toy Holocaust"), which some may take as a naked bid for Best Picture recognition. In happier moments, the story also continues the series' tradition of celebrating the joy of creative play—with the filmmakers putting their money where their mouths are by imagining the secret life of toys. Ultimately, the film and the franchise resolve in a requiem for childhood that also allows the toys a touching curtain call that will have anyone who ever had a toy reaching for facial tissue. 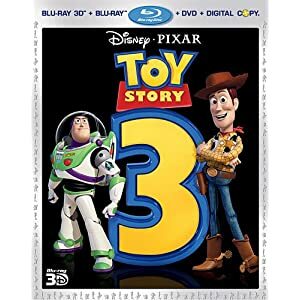 Disney Home Entertainment goes all out to wrap up the Toy Story trilogy with its deluxe Blu-ray 3D editions, including a box set and an individual Toy Story 3 Blu-ray 3D + Blu-ray + DVD + Digital Copy combo pack, upgrading last year's 2-Disc Blu-ray + DVD + Digital Copy special edition. As expected, the A/V quality achieves something very close to perfection. Aside from a wee bit of banding (a flaw common to animated titles), the all-CGI image is jaw-droppingly vibrant. The rich primary colors pop, contrast and black level are rock solid, and detail and textures are razor sharp. The 3D transfer is, hands-down, reference quality for the format, sculpting the characters and settings in convincing depth and providing plenty of pop. I could detect no crosstalk: rather, this 3D presentation is everything the format promises, even exceeding expectations in retention of all the great qualities of the 2D transfer while adding awesome 3D effects. The image meets its match in a state-of-the-art DTS-HD Master Audio 7.1 surround presentation that gives full body to action and music, with immersive ambient effects, and crystal clear dialogue well prioritized in the winningly detailed mix. 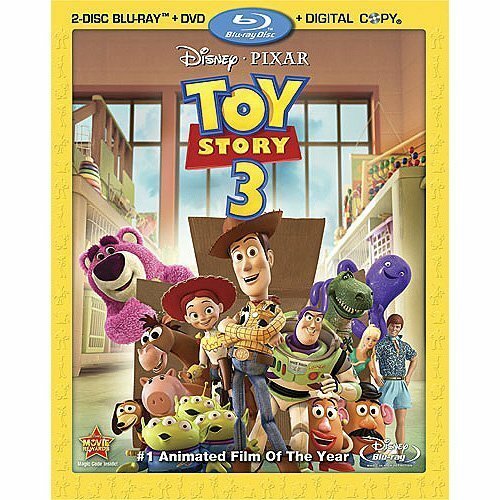 Keeping in line with the prequel releases, the Toy Story 3 set is jam-packed with bonus features. Disc one includes the charmingly old-fashioned conceptual animated short "Day and Night" (5:58, HD), which preceded the feature in theaters. "Buzz Lightyear Mission Logs: The Science of Adventure" (4:25, HD) wraps up the series of shorts featuring Buzz informing Hamm and T-Rex about his trip into space with NASA and the scientific work of the shuttle mission. "Toys!" (6:38, HD) gives a fleet overview of the latest characters added to the Toy Story universe; this might sound like an animated dossier, but it's actually a nifty behind-the-scenes promo with Pixar crew interviews. Lest you think Pixar forgot a commentary, the actually provide two; it's just that they are, oddly enough, located on disc two. The Cine-Explore picture-in-picture commentary by director Lee Unkrich and producer Darla K. Anderson includes a look at storyboard sketches, concept art and CG models, while audio-only Beyond the Toybox: An Alternative Commentary Track with supervising animator Bobby Podesta, supervising technical director Guido Quaroni, production designer Bob Pauley, supervising animator Mike Venturini and story supervisor Jason Katz takes us even deeper into the process of crafting the film and points out every in-joke in the nooks and crannies of the film. "The Gang's All Here" (10:46, HD) gathers cast and crew to discuss returning to the Toy Story characters. "Goodbye Andy" (8:02, HD) profiles John Morris, who discusses playing Andy and explains how his scenes were crafted from a production perspective. "Accidental Toymakers" (3:56, HD) gives an overview of how Thinkway Toys landed the contract to make real-life Woodys and Buzz Lightyears (and how they do it). "A Toy's Eye View: Creating a Whole New Land" (5:14, HD) looks at the presence of Toy Story characters in Disney theme parks. "Epilogue" (4:23, HD) is the film's credits sequence, here allowed to fill the screen. "Roundin' Up a Western Opening" (5:42, HD) focuses in on the creative process of conceiving and executing the film's opening sequence. "Bonnie's Playtime: A Story Roundtable" (6:26, HD) sits down Unkrich and assorted crew to discuss the Bonnie scenes. "Beginnings: Setting a Story In Motion" (8:13, HD) is an animated featurette about how screenwriter Michael Arndt crafted the plot in concert with Pixar. "Life of a Shot" (6:57, HD) finds Anderson and various crew members discussing modeling and various design departments, including color, sets, painting, styling, animating, effects, shot lighting, and music. "Making of 'Day & Night'" (2:00, HD) gives a swift overview of the creation of the short. "Paths of Pixar - Editorial" (4:38, HD) showcases the Pixar editing staff. The Studio Stories series continues with "Studio Stories: Where's Gordon" (2:16, HD), "Studio Stories: Cereal Bar" (1:36, HD) and "Studio Stories: Clean Start (3:05, HD). Toy Story Trivia Dash is an interactive trivia game (y'know, for kids). The "Grab Bag" of publicity goodies gathers amusing original content and trailers: "Ken's Dating Tips" (1:30, HD) "Lots-O'-Huggin' Bear Commercial 1" (:30, HD), "Lots-O'-Huggin' Bear Commercial 2" (:30, HD), "Making of the Lots-O'-Huggin' Bear Commercials" (1:28, HD), "Internet Chat" (1:00, HD), "Security Cam" (1:12, HD), "Gadgets" (:58, HD), "'Dancing with the Stars' at Pixar" (2:21, HD), "TS3 Silence Trailer" (:40, HD), "TS3 Antipiracy Trailer" (1:04, HD), "TS3 Teaser Trailer" (1:44, HD), "TS3 Trailer 2" (2:21, HD), "TS3 Trailer 3" (2:30, HD), "TS3 Japan Teaser Trailer 1" (1:02, HD), "TS3 Japan Trailer 2" (2:44, HD), "Character Intros" (2:00, HD) and a Poster Gallery. All site content © 2000-2019 Peter Canavese. Page generated at 04/21/2019 12:07:47AM.